Our proposal has the aim to properly reflect the MBQ’s activity and sustain future growth by creating a space that has the ability to transform due to its flexibility and adapt for different events inside or outside the proper space. MBQ principles can be seen in the imperfect finish and figural rawness of the walls and also in the textures, tones, and figural shapes that we used. The combed plaster walls together with the microcement floor have this rawness that creates a perfect backdrop for the products featured in the shop. The upper part of the wall and also the industrial ceiling will be painted in the same darker tone, so that the visitors will focus on the exposing area. The proposed lighting system will consist in spotlights on rails that can be slided depending on what products are and how will they be exposed. 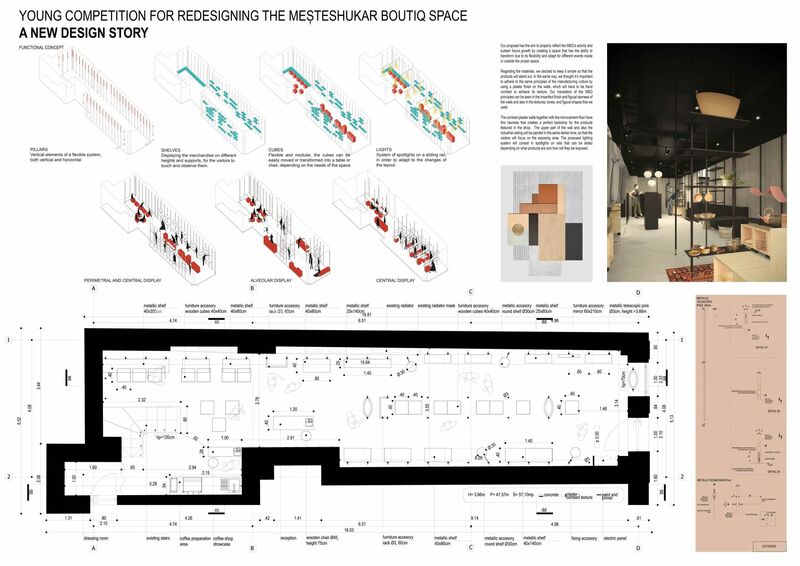 The proposed exhibiting system allows the space to adapt to changes and endure changes over time due to this modular pieces which may be rearranged and rebuilt as needed. These pieces will be manufactured using a combination of materials: metal, wood and leather. Also the actual display furniture can be recycled to create the new one. 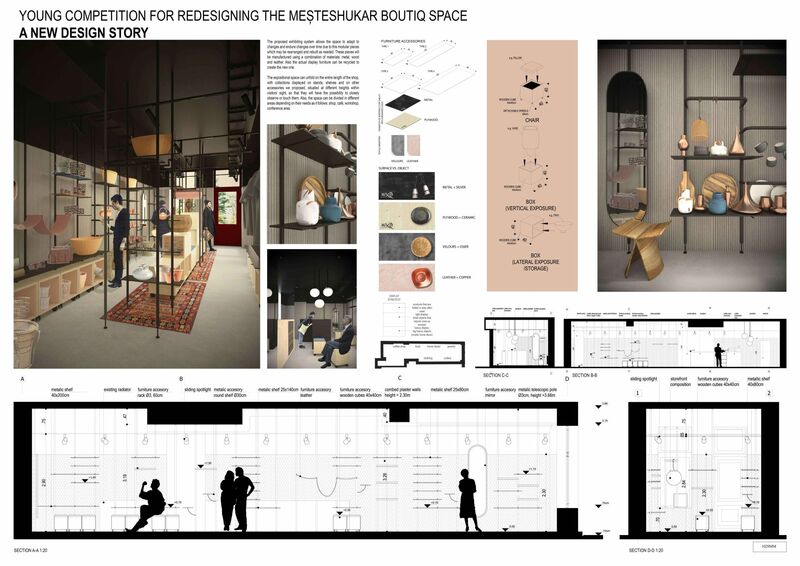 The expositional space can unfold on the entire length of the shop, with collections displayed on stands, shelves and on other accessories we proposed, situated at different heights within visitors’ sight, so that they will have the possibility to closely observe or touch them. Also, the space can be divided in different areas depending on their needs as it follows: shop, café, workshop, conference area. The most important feature of the exhibiting system is that it is easy to mount and rearrange. There is no need for professional tools or need to drill holes in order to mount the pillars because they are equipped with telescopic soles that can be easily clamped between floor and ceiling. Also, more shelves and accessories can be added or removed depending on how many products are exhibited within the shop. This layout flexibility can offer an improved visual experience for the visitor.